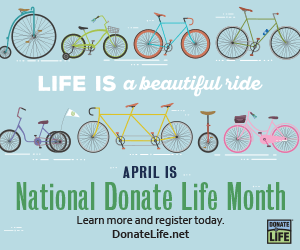 [April 1, 2019-Richmond, VA]— April is National Donate Life Month. Every year, Donate Life America leads the celebration of National Donate Life Month (NDLM) to focus national attention on organ, eye and tissue donation and transplantation — to share the importance of registering your decision to be a donor, honor deceased and living donors, and celebrate the lifesaving and healing gift of transplantation. “This April, we want to remind everyone that they can help save a life. Registering your decision to be an organ, eye and tissue donor takes less than a minute and gives hope to those waiting. The decision to register as a donor is the beginning of a story that may bring life and healing to more than 75 people, their families and their communities,” says David Fleming, President & CEO of Donate Life America. Bicycles serve as a symbol of progress, renewal and the moving circle of life. We each carry the potential to help make LIFE a beautiful ride for ourselves, and then for others by registering as a donor, considering living donation, being a caregiver and championing the Donate Life cause. The NDLM bicycle theme and art will be incorporated into celebrations and events across the country during April. More information and public resources are available at DonateLife.net/ndlm/. On National Donate Life Blue & Green Day, the public is encouraged to wear blue and green Donate Life colors, hold events, and partner with local restaurants, malls, media and community organizations to spread awareness about organ, eye and tissue donation and transplantation. There is also a public Blue & Green Day photo contest through the Donate Life America Facebook page for everyone to show their creative blue and green spirit! More information and public resources are available at DonateLife.net/blue-green-day/. The last week of National Donate Life Month is dedicated to kids. National Pediatric Transplant Week provides a platform to talk about the potential of ending the pediatric waiting list, to share innovative work and patient stories of transplant candidates and recipients, and to honor donor families whose children have saved and healed lives through donation. More information and public resources are available at DonateLife.net/pediatric-transplant-week. 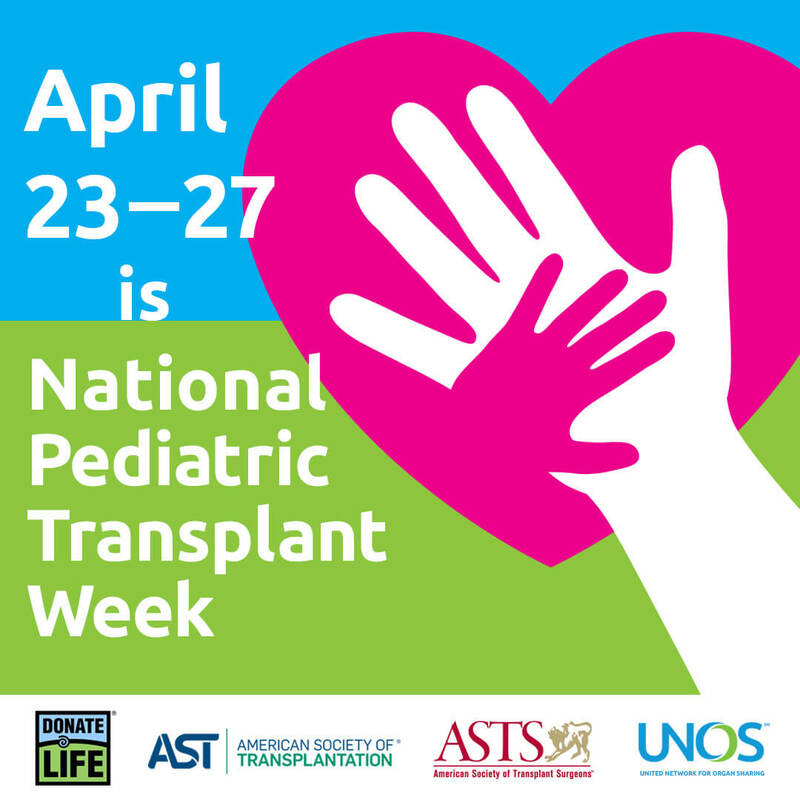 Donate Life America (DLA) partners with the United Network for Organ Sharing (UNOS), the American Society of Transplantation (AST) and the American Society of Transplant Surgeons (ASTS) to celebrate and promote National Pediatric Transplant Week. 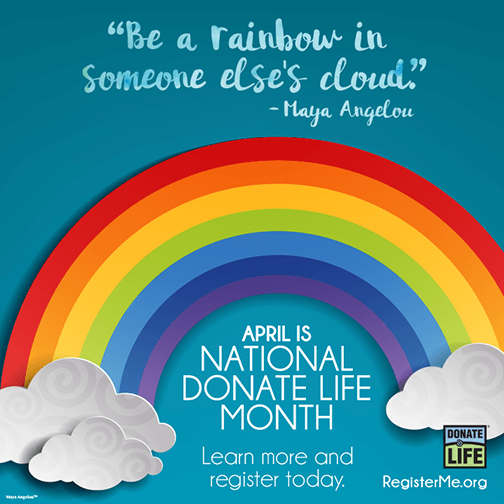 During April, Donate Life America celebrates that 58 percent of U.S. adults have registered their decision to make LIFE possible as organ, eye and tissue donors at the time of their death. DLA is also dedicated to bringing attention to the national transplant waiting list, 115,000 people are currently waiting for a lifesaving transplant. On average, 22 people die each day because the organ they need is not donated in time — almost one person dying every hour. Thousands more people are waiting for lifesaving and healing eye and tissue transplants. You can help by registering your decision to be an organ, eye and tissue donor, and learning more about living donation. You can register your decision to be an organ, eye and tissue donor at RegisterMe.org or in the Medical ID tab of your iPhone Health app. To learn more about being a living donor, please visit DonateLife.net. Donate Life America (DLA) is a 501(c)3 nonprofit organization leading its national partners and Donate Life State Teams to increase the number of donated organs, eyes and tissue available to save and heal lives. DLA manages and promotes Donate Life℠, the national brand for the cause of donation; motivates the public to register as organ, eye and tissue donors; provides education about living donation; manages the National Donate Life Registry at RegisterMe.org; and develops and executes effective multi-media campaigns to promote donation. 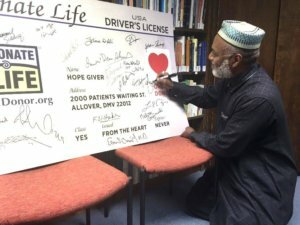 On behalf of the Donate Life Community, Washington Regional Transplant Community (WRTC) is pleased to announce the newly released, and first-ever, fatwa* by the Fiqh** Council of North America (FCNA) declaring that organ donation*** and transplantation is permissible within the Islamic faith and among American Muslims. 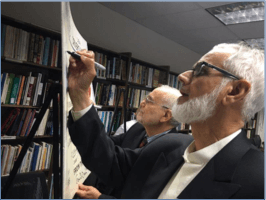 Founded in 1986, the FCNA is a body of recognized and qualified Islamic scholars from the United States and Canada who interpret Islamic law in the North American environment. Its 19 members issue religious rulings (fatwas), resolve disputes and answer questions relating to the Islamic faith, with the goal of developing methodologies for applying Islamic law to life in the West. Until now, the issue of organ donation among American Muslims had never reached consensus or received an official ruling. Over the past four years, WRTC led the effort to bring together national leaders in donation and transplantation (AOPO, DLA, UNOS, HRSA) with the FCNA and other influential Muslim academic and religious scholars, to reach consensus on this issue. This fatwa is the result of that effort. It’s important to note that in this fatwa the FCNA states that it is still seeking clarity among its 19 members on the issue of brain death, and whether it meets the standards of legal death in Islam. But this point of internal debate does not conflict with, or supersede, its “Permissible” ruling on organ donation. In the coming weeks WRTC will be finishing work on a comprehensive toolkit with resources designed to help OPOs and Donate Life State Teams implement a Muslim outreach initiative (both clinical and community-based) in their respective DSAs. This toolkit will be available on the AOPO Portal and the DLA Community Site. If you have any questions regarding this announcement, please contact Lesley Compagnone, WRTC’s Director of Community Affairs at lesleyc@wrtc.org. * A ruling on a point of Islamic law given by a recognized authority. ** The theory or philosophy of Islamic law based on the teachings of the Quran and the traditions of the Prophet. *** This ruling applies only to solid organs. The FCNA has not discussed, or ruled on, eye and tissue donation. In the summer of 2016, the International Institute of Islamic Thought (IIIT) held the country’s first Fiqh Forum on organ donation. 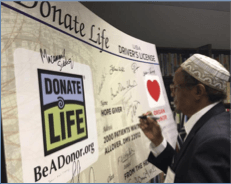 After the event, several of the world’s most influential Muslim academic and religious scholars symbolically demonstrated their collective support of organ donation and transplantation acceptance for North American Muslims. 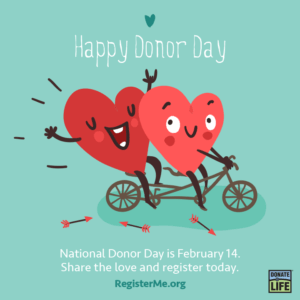 Observed every year on February 14th, National Donor Day is an observance dedicated to spreading awareness and education about organ, eye and tissue donation. By educating and sharing the Donate Life message, we can each take small steps every day to help save and heal more lives, and honor the donor’s legacy of generosity and compassion. National Donor Day is a time to focus on all types of donation—organ, eye, tissue, blood, platelets and marrow. Join us by participating in local events, sharing social media messages and encouraging others to register as donors. National Donor Day is also a day to recognize those who have given and received the gift of life through organ, eye and tissue donation, are currently waiting for a lifesaving transplant, and those who died waiting because an organ was not donated in time. In addition to registering to be an organ, eye and tissue donor or contributing to the DLA cause, you can also download our National Donor Day images and Donor Day Valentine’s Cards to raise awareness about donation throughout social media—link these images to other resources for your friends and followers to utilize within your local and online communities. The Donate Life America Tribute Wall is one way to honor loved ones on National Donor Day. You can also read through our Stories of Hope, inspiring organ, eye and tissue donor and recipient stories. Explore more things you can do to support Donate Life America and advocate for organ, eye and tissue donation every day of the year. Visit DonateLife.net/celebrations/national-donor-day to learn more about National Donor Day! (Richmond, VA—September 21, 2018) Donate Life America (DLA) and Donate Life State Teams are dedicating the week of September 24-28, 2018, to saying thank you to Motor Vehicle Departments (DMVs) across the country for their commitment to asking the donor registration question to DMV customers every day. The vast majority of donor registrations in the U.S. come through DMV and driver’s license partner transactions. DMV offices and their employees play an invaluable role in increasing the number of registered organ, eye and tissue donors. Through their dedication to the Donate Life mission, DMV leadership and staff help save and heal lives. National DMV Appreciation Week is a one-week celebration held each year in the last week of September. 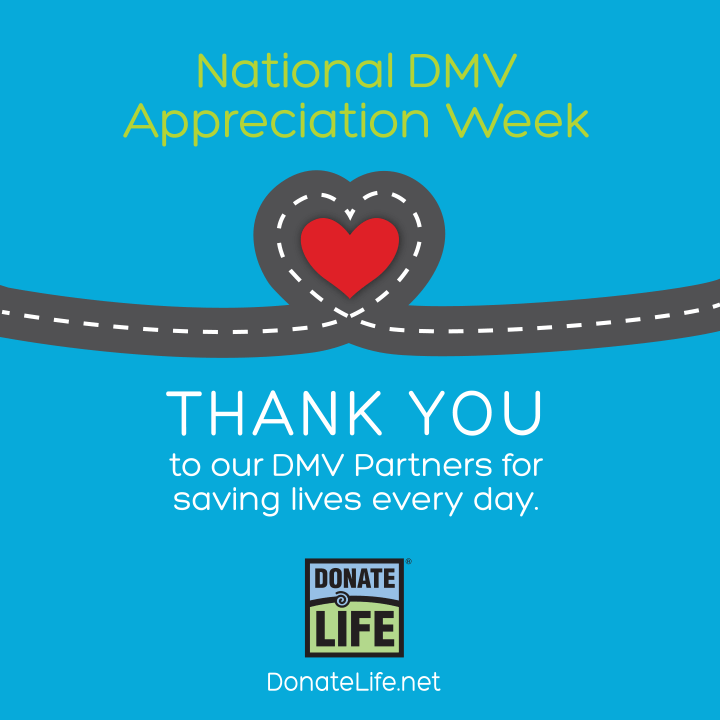 During this week, the Donate Life Community celebrates this vital partnership through local events and outreach expressing gratitude to DMV and driver’s license partner staff and leadership across the country. Donate Life America will be celebrating National DMV Appreciation Week by recognizing the regional and national winners of the 2018 DLA DMV Awards. These awards recognize both statewide DMV efforts and individual dedication to successfully increase donor registration. DLA is grateful to have the American Association of Motor Vehicle Administrators (AAMVA) as a national partner supporting the role of DMVs in offering the donor registration opportunity and helping to save lives through organ, eye and tissue donation. To register your decision to be an organ, eye and tissue donor in the National Donate Life Registry, please go to RegisterMe.org. To learn more about the DLA DMV partnership and National DMV Appreciation Week, please visit DonateLife.net/DMV. (Richmond, VA—June 25, 2018) — Multicultural communities are disproportionately in need of lifesaving organ transplants – especially kidneys. Currently, 58 percent of the U.S. transplant waiting list is comprised of multicultural patients. Donate Life America (DLA) and the Association for Multicultural Affairs in Transplantation (AMAT) created Donate Life ECHO to focus on the importance of donation and transplantation in multicultural communities. ECHO stands for Every Community Has Opportunity – the opportunity to save and heal lives through donation and transplantation. Donate Life ECHO, July 8-21, 2018, is a national observance that engages social media and community storytelling to talk about donation education, highlight the importance of registering to be an organ, eye and tissue donor, honor donors and donor families, and celebrate what transplant has made possible in multicultural communities. Increasing educational efforts, outreach and registration opportunities are vital steps towards increasing the number of registered donors and lives saved in multicultural communities. Boomerang #DonateLifeECHOChallenge: DLA and AMAT are inviting the public to share a boomerang video on Instagram about why donation is important to them and/or their community. Donate Life ECHO Challenge participants will tag @donatelifeamerica, use the hashtag #DonateLifeECHOChallenge and encourage people to register their decision to be a donor at RegisterMe.org. Walgreens efforts to help raise consumer awareness: Throughout July, information about Donate Life ECHO will be featured on Walgreens health resource panels included with prescriptions filled at its retail and local specialty pharmacies nationwide. Walgreens will also be hosting donor registration drives at Walgreens stores in six markets across the country: Washington, D.C.; Atlanta, GA; Miami, FL; San Antonio, TX; Detroit, MI; and Phoenix/Tucson, AZ. Donate Life Caregiving: This year, the Donate Life ECHO observance will center on the theme of Donate Life Caregiving. DLA and AMAT are paying homage to the caregivers within and for our communities. Caregivers are vital to the health and well being of patients, families and our societal fabric. The thread of Donate Life Caregiving will be woven through stories shared during the two weeks of Donate Life ECHO. Videos focused on Donate Life Caregiving, submitted by organizations across the country, will be featured on DLA social media platforms during the last week of ECHO. Join us in celebrating 2018 Donate Life ECHO. Donate Life ECHO resources are available in English, Spanish and additional languages. Resources and more information about how to be a part of Donate Life ECHO are available at: DonateLife.net/ECHO and amat1.org/programs/ECHO. You can register your decision to be an organ, eye and tissue donor in the National Donate Life Registry at RegisterMe.org, in the Medical ID Tab of your iPhone Health App, or in Spanish at DoneVida.org. Data from Organ Procurement and Transplantation Network (OPTN) as of April 20, 2018. AMAT was established in 1992 to address the increasing need for organ, eye and tissue donors in the multicultural communities, while simultaneously offering support, shared expertise and professional development opportunities for its members as they save and heal lives. AMAT is a self-sustaining, self-governed organization operating solely on voluntary contributions from individuals, corporations, and other affiliated organizations. For more information, visit: www.AMAT1.org. Donate Life America is a 501(c)3 nonprofit alliance of national organizations and Donate Life State Teams across the United States committed to increasing the number of donated organs, eyes and tissue available for transplant to save and heal lives. Donate Life America manages and promotes the national brand for donation, Donate Life℠; develops and executes effective multi-media donor education programs; motivates the American public to register now as organ, eye and tissue donors; manages the National Donate Life Registry, RegisterMe.org; and assists Donate Life State Teams and national partners in facilitating high-performing donor registration programs. For more information, please visit DonateLife.net. Join us in celebrating a new observance during the last week of National Donate Life Month: National Pediatric Transplant Week. National Pediatric Transplant Week grew from the question of a father whose young son is a heart recipient: Can we as a national Donate Life Community create a dedicated observance to raise awareness and help save the lives of children waiting for transplant? National Pediatric Transplant Week offers donation and transplantation organizations the platform to talk about the powerful message of ending the pediatric waiting list, to engage clinical partners to share their innovative work and patient stories (candidates and recipients), and to honor donor families whose children have saved and healed lives through organ, eye and tissue donation. National Pediatric Transplant Week gives pediatric donor and recipient families an opportunity to share their stories, encourage others to help save and heal lives by registering to be organ, eye and tissue donors and to learn more about becoming a living donor. Donate Life America (DLA) would like to thank the United Network for Organ Sharing (UNOS), the American Society of Transplantation (AST) and the American Society of Transplant Surgeons (ASTS) for their collaboration and support in piloting the first annual National Pediatric Transplant Week. Currently, nearly 2,000 children under the age of 18 are on the national transplant waiting list. More than 500 of the children waiting for transplant are between 1 and 5 years old. More than 1,800 children received transplants in 2017. There were nearly 900 pediatric organ donors in 2017. The donors ranged in age from newborn to age 17, most were between 11 and 17 years old. In 2017, more than 120 pediatric organ donors were babies under the age of 12 months. The size of the recipient’s body and the donor organ are taken into account when matching donors to recipients. Very small children most often receive donations from other young people – although older children and adults can also be a good match. Sometimes, children can receive deceased or living donations of partial organs, like a portion of a liver. Most children under the age of 1 year are waiting for a heart or a liver. Most children age 1 to 5 years are waiting for a kidney, liver or heart. Most children age 5 to 10 years are waiting for a kidney. Most children age 11 to 17 years are primarily waiting for a kidney, followed by liver and heart. Pediatric donation: A parent or legal guardian must authorize the donation for anyone under the age of 18 years. 15-17 year olds may register their intent to be a donor; however, until they are 18 years old, a parent or legal guardian makes the final donation decision. For more information about National Donate Life Month, please visit: https://www.donatelife.net/ndlm/. * Living donation is not included in a donor registration. Data from the Donate Life America Quarterly Donor Designation Report and the Organ Procurement and Transplantation Network (OPTN) as of March 19, 2018. [April 3, 2018 – Richmond, VA]—Every April, Donate Life America celebrates National Donate Life Month, focusing national attention on every individual’s power to make LIFE possible by registering their decision to be an organ, eye and tissue donor, and learning more about living donation. Often following a storm, the presence of a rainbow provides optimism and motivates us to endure through dark times. Organ, eye and tissue donation is the bridge of comfort and hope between one family’s mourning and another’s healing — turning tragedy into renewed life. The Donate Life rainbow in the National Donate Life Month artwork rises from stormy clouds, recognizing that it takes both rain and light to create the gift of a rainbow. Maya Angelou’s message applies to all of us, no matter our background or experiences. We all know rainbows in the people that have helped carry us through life and its challenges. In turn, we have the opportunity to be rainbows in other people’s clouds through the gift of organ, eye and tissue donation. By registering to be a donor and considering living donation, you can change one ray of light into a spectrum of healing and compassion. “The act of registering your decision to be an organ, eye and tissue donor takes less than a minute. Your one action can serve as a lifesaving prism, transforming your decision into life and healing for more than 75 people, their families and their communities,” says David Fleming, President & CEO of Donate Life America. You can register your decision to be an organ, eye and tissue donor at RegisterMe.org or in the Medical ID tab of the iPhone Health app. To learn more about being a living donor, please visit DonateLife.net. This year, Donate Life America will also be celebrating a new observance during the last week of National Donate Life Month: National Pediatric Transplant Week. 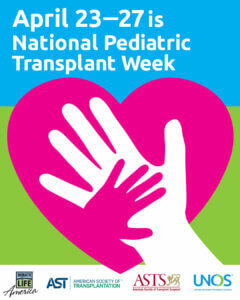 National Pediatric Transplant Week offers donation and transplantation organizations the platform to talk about the powerful message of ending the pediatric waiting list, to engage clinical partners to share their innovative work and patient stories of transplant candidates and recipients, and to honor donor families whose children have saved and healed lives through organ, eye and tissue donation. We celebrate that 56 percent of U.S. adults have registered their decision to make LIFE possible and be organ, eye and tissue donors at the time of their death. Yet the number of people in need of transplants continues to outpace the number of organs donated. Currently, 115,000 people are waiting for a transplant and a second chance at life. On average, 22 people die each day because the organ they need is not donated in time—that is almost one person dying every hour. You can help by registering your decision to be an organ, eye and tissue donor, and learning more about living donation. Americans celebrate the blessing of life in many ways, but perhaps none is more transformative than their choice to donate organs or tissue to family members, friends, or to people they may not ever meet. During National Donate Life Month, we honor our Nation’s organ and tissue donors for their decision to give the precious gift of life to someone in need. We also give thanks to the many remarkable medical professionals, scientists, and researchers who have dedicated themselves to improving the health of others. My Administration supports efforts to raise awareness about the life-saving power of organ donation. The Organ Procurement and Transplantation Network reports that, in 2017, there were nearly 35,000 transplants performed, a 3.4 percent increase from 2016, and the fifth consecutive record-setting year for transplants in the United States. Last year, more than 16,000 living and deceased individuals donated the gift of life to someone in need through an organ or tissue donation. Every person, regardless of gender, age, race, ethnicity, or economic status, has the power and the potential to transform a life through organ and tissue donation. Despite record setting years, we are still working to overcome a gap between the availability of organs and people in need of an organ donation. Today, nearly 115,000 Americans are awaiting a lifesaving transplant, and a new name appears on the national transplant waiting list every 10 minutes. Amazingly, 1 donor can save up to 8 lives through organ donation and enhance the lives of up to 50 people through tissue donation. This month, I encourage all Americans to consider participating in the gift of life by becoming organ and tissue donors. NOW, THEREFORE, I, DONALD J. TRUMP, President of the United States of America, by virtue of the authority vested in me by the Constitution and the laws of the United States, do hereby proclaim April 2018 as National Donate Life Month. I call upon health professionals, volunteers, educators, government agencies, faith-based and community groups, and private organizations to help raise awareness of the urgent need for organ and tissue donors throughout our Nation.